The WIT Access Volunteer Programme works with the wider local community to promote access to Further and Higher Education. We do this through developing links with local schools and community groups and by equipping volunteers with appropriate experience and transferable skills such as communication, teamwork, and project management. We run two volunteer training programmes, one is aimed at recruiting WIT students and the other is aimed at recruiting parents of school going children. Student volunteers act as positive role models for young pupils and they introduce them to a variety of aspects of college life. All volunteers must partake in the Volunteer Training Programme and training is provided outside lecture hours and is 12 hours approx. in total. 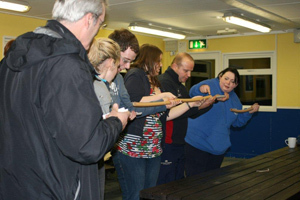 We use the training facilities in WIT and various venues in the South East to work on the team building aspects of the programme. The training emphasises the importance of role models as a feature of any young person's life. Approximately 200 volunteers have received the 'Volunteering Certification' since the inception of the programme in 2001. WIT Student Volunteers are recruited from across all the academic schools: Business, Science, Engineering, Humanities, and Health Sciences. "It taught me how to be assertive but kind"
This programme provides opportunities to train parents as volunteers in the provision of after school supports for pupils attending local primary schools. The out-of-school environment complements traditional education and provides a safe space where children can build on educational skills learned in school, while also developing the necessary social and emotional skills which support their development as they grow up. It is targeted at parents who have children attending local primary schools with a particular focus on parents who have children attending the WIT Junior Access Programmes. All volunteers must partake in a Volunteer Training Programme of approx. 24 hours of directed training (classroom theory) and 16 hours of work placement (40 hours in total). "Susan’s daughter spoke about becoming a doctor – before I would not have known how to negotiate the system. Now I can help her realise her dream." I am a role model for my children now - I will always advise them on college life and encourage, support and motivate them to go further with their education after second level – lucky I had the opportunity to, now I can pass on my skills, knowledge and experience to them "
"I think one of the magic moments for me was when I received the Certificate as it reassured me that I can do it and that I have the courage to try to succeed"
This officially recognised Institute award is awarded at the end of the academic year at a special ceremony at the Clubs and Societies Awards night. The WIT Access Student Volunteering Certificate recognises the volunteering, training and personal, academic and professional reflection undertaken by the student. There is no doubt that the certificate also looks good as part of a CV! We are happy to give individual assistance to volunteers to make their submission for certification. You need to be an active volunteer for at least one semester. To be considered for certification in this academic year, you must submit your reflective log before 31st March through moodle. WIT Access Office - Learning for Life Programme (L4L) - on WIT Main Campus and College St Campus 3pm-5pm every Mon, Tues, or Wed – Schools- St Saviours, Presentation, & ST Pauls. If anyone has a car, for Colaiste Cois Siuire (Moincoin) Secondary Homework Club (4.00 - 5.00) also on Mondays, Tuesdays & Thursdays. Volunteers needed to give one hour per week to help tutor leaving cert and junior cert students on a one to one basis in a subject you are strong in. WIT student Volunteers who complete 20 hours volunteering over their time in WIT will receive the “WIT Community Service Award Certificate”, gain personal satisfaction & growth, valuable work experience and looks great as part of a CV.